Yesterday, the Motherlode blog from the New York Times featured a guest post called “Talking About Race (Etc. )” by Amanda Freeman, a white woman who parents two African-American step-kids along with her half-Asian biological daughter. Freeman narrated two recent experiences which made her think critically about racism. 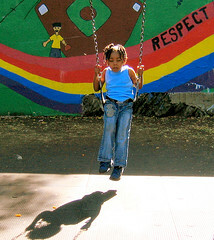 In the first, a black cop rounds up “unattended” children at a playground, including–much to her shock and dismay–her step-children; the second anecdote is about a coffee date with another mother, who mentioned how Freeman’s African-American children had a better chance at being admitted to college than her half-Asian daughter. Because we live in this new America that celebrates diversity, I have to remind myself not to forget these little happenings. The real danger lies in being lulled into complacency, erasing race from our national dialogue, checking off the completed box. Racial stereotypes in America run deep; they are woven into our everyday expectations. And we can’t let them go unexamined. What I do know is that ignoring the subtext of these situations fails everyone involved. The more we try to process our complicated feelings about race, the less likely they are to erupt in ugly ways.